Adieu, Annus Horribilis; Bienvenue, Annus Horribilis? This is the time of year for contemplation of things past and expectation of things to come. 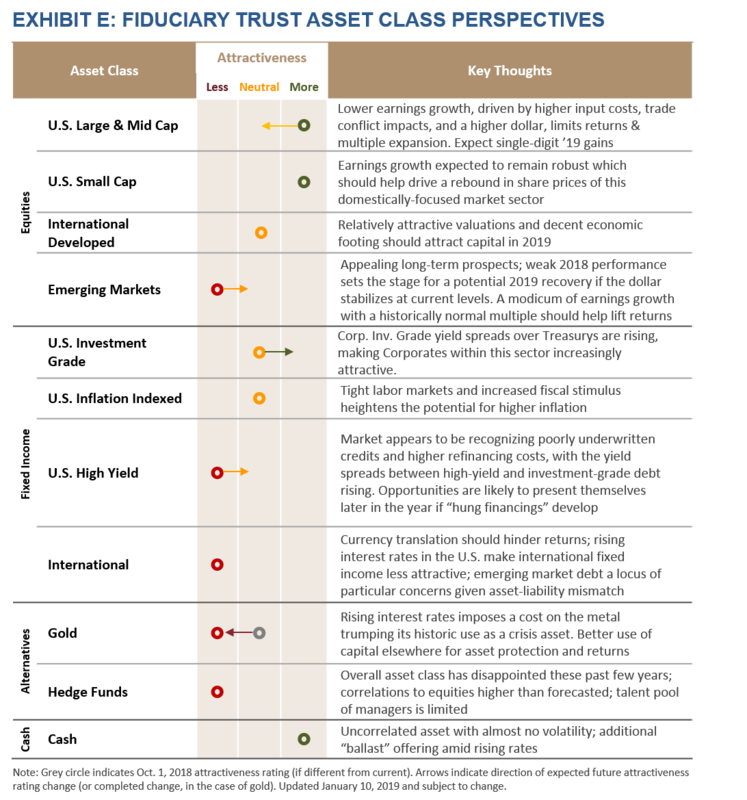 Offering a pithy summary of the current state of play is especially challenging this year, as markets, economies, and the societies in which they operate have provided a remarkable study in contrasts. Against the backdrop of a growing — and perhaps slowing — global economy, market returns were almost uniformly negative in 2018. Developed market equities, whether domestic or international, posted declines for much of the year. 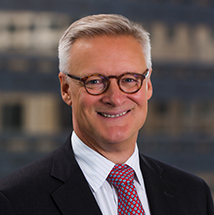 In the United States, fixed income securities offered a limited safe harbor from the decline in equity prices. Similarly, commodities offered no safe haven from volatility as precious metals and energy failed to deliver any material aid in generating a positive return. Indeed, with inflation rising, gold failed to offer any protection or diversification. Political discord and the attendant volatility in policy has started to exert itself as tariffs have begun to impact businesses. For the most part, investors have remained unperturbed by global policy discord, but that is likely to change. As the business cycle ages, it becomes more important to have strong consumer and business confidence to serve as a buffer against the structural weakness that inevitably emerges. Enduring and unresolved geo-economic and geopolitical conflicts will eventually take their toll on the confidence of businesses to invest and consumers to spend. A dent in consumer and business confidence has started to emerge which, along with a recently formed inverted yield curve, hints that a sea change is developing. If past is prologue, these developments indicate that a change in the business cycle is not imminent. It suggests that the margin of safety in which the economy is operating — and which the market enjoys — is shrinking. Measures of policy resolution and stability would go a long way toward staving off the inevitable turn in the business cycle. What follows is our take on the last year and what may lie ahead. It has been a rich and varied year in markets. Our forecast is for more of the same. U.S. equities finished the year in negative territory, with 2018 proving to be a challenging year all around. Most major markets entered into a correction during the past 12 months, as political turmoil, trade strife, and rising interest rates created headwinds across global equity and fixed income markets. Major commodities, from oil to metals, also slumped during the year, while decelerating home sales and a wave of retail bankruptcies revealed cracks in both residential and commercial real estate markets. Even Bitcoin, the avatar of all things digital, entered into a bear market, finally putting to rest the misconception that cryptocurrencies would one day replace gold as the prevailing safe haven during market turmoil. In hindsight, 2018 was a year of contradictions. The U.S. economy continued to fire on all cylinders, which gave the Federal Reserve the confidence to continue lifting interest rates under its program of policy normalization. Corporate profit growth, turbocharged by the Tax Cuts and Jobs Act passed in late 2017, reached levels typically associated with the early stages of economic recovery and proved critical in keeping the U.S. markets on track, even as material threats emerged. To be sure, several key catalysts should instill a modicum of confidence for 2019, from continued economic growth to equity valuations that remain reasonable due to this year’s strong profit growth. The focus over the next 12 months should start to pivot to more exotic concerns in the realm of “known” unknowns, including business confidence and the trade war’s toxicity on global profit and economic growth. Additionally, investors are digesting a rapidly increasing stockpile of government debt issued to fund ballooning deficits, which makes for a fine bout of existential angst with which to contend. The macroeconomic backdrop has been as favorable as any environment since the current market expansion took hold in 2009. 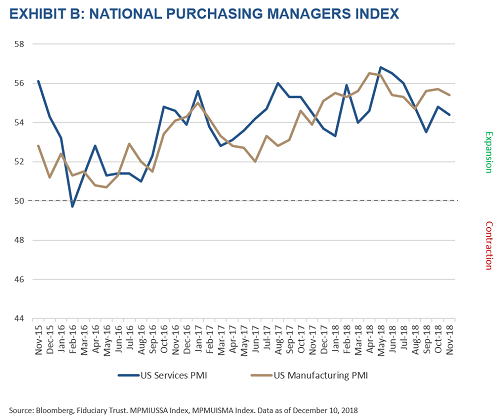 Economic activity in the manufacturing and services sectors, for instance, saw uninterrupted growth throughout 2018 (Exhibit B), while the unemployment rate declined to 3.7% as of November 2018, matching 49-year lows. 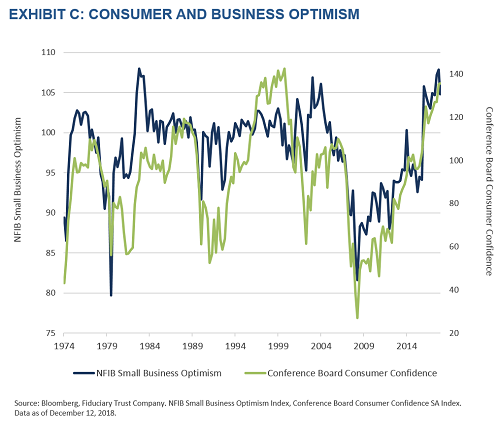 As a result, both consumer and business sentiment readings reflect an optimism (Exhibit C) that has further fueled retail sales growth and capital investment. In fact, just about every other leading indicator — including the latest GDP readings — points to ongoing economic strength to start the year. It appears as though the Federal Reserve is close to proclaiming “Mission Accomplished” with its policy normalization efforts. With inflation operating durably above 2%, the central bank can contemplate winding down its short-term interest rate hikes. However, the Fed will continue to pursue balance sheet shrinkage through runoff of maturing government bonds and agency debt in an effort to normalize its balance sheet. Indeed, central bankers have softened the language of how they are thinking about future policy. Two more quarter-point rate hikes are our base case for 2019. This is not to say that rising rates have not already occasioned certain knock-on effects. The strong U.S. dollar, driven in part by monetary policy, has softened tariffs’ impact on U.S. imports. At the same time, it has created headwinds for commodities and emerging market stocks, particularly for shares of companies with dollar-denominated debt. Emerging market equities, as a result, were among last year’s worst performing categories. Closer to home, though, investors have been intently focused on the flattening yield curve. The spread between the two- and 10-year Treasury notes exceeded 50 basis points when the year began. By mid-December, however, the spread had narrowed to as low as 11 basis points. Perhaps more concerning: the yield on two-year Treasury notes eclipsed the yield on five-year notes in early December, representing the first time since 2007 that that part of the yield curve had been inverted (Exhibit D). We have previously noted that a flattening yield curve raises concerns that the economy is slowing. An inverted yield curve, however, is far more ominous. 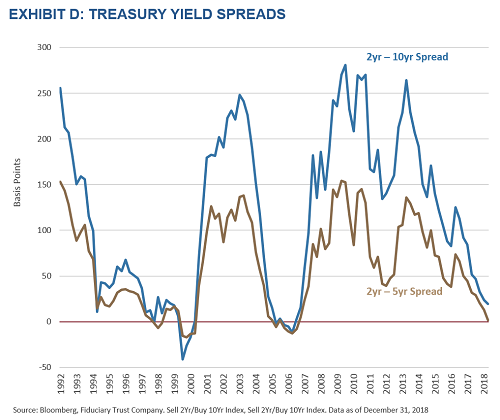 It would be even more alarming if the spread between the two- and 10-year notes turned negative, a precedent that has accompanied every recession since the mid-1970s. A recurring source of optimism throughout 2018 has been the strength of corporate earnings growth. Analysts project that the fourth-quarter reporting season (in which the bulk of S&P 500 companies will report year-end results in January and February) will result in quarterly profit growth in excess of 13%.1 Barring any material downward revisions of expectations or notable surprises when companies report, this would mark the fifth straight quarter of double-digit earnings growth. As expected, the tax cuts provided a shot in the arm in 2018. That’s the good news. 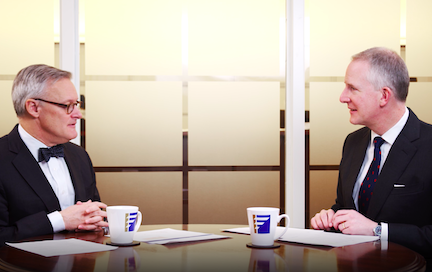 The challenge confronting investors in 2019 is the high bar that will make year-over-year earnings-growth comparisons difficult as companies begin to lap their robust 2018 performance. The consensus expectation is for annual earnings growth to decelerate considerably next year. Current projections, according to FactSet, are for a 9% increase in S&P 500 profits, while we expect that the reality will be closer to 6% to 7%. These numbers represent the best-case scenario, so investors will once again have to acclimate to a more normalized delta when assessing earnings growth. Perhaps the biggest risk to earnings in 2019 will be impact of a strong U.S. dollar, which will weigh on profit growth if it does not moderate over the next 12 months. Indeed, roughly 37% of sales generated among S&P 500 companies stem from non-domestic sources.2 While the case for domestic equities remains cautiously optimistic, particularly as valuations have become more attractive, investors should acknowledge the likelihood that recent market volatility will become increasingly normal as part of the aging business and market cycle. Many attribute the second half of 2018’s market weakness to the length of the current expansion: In August, the present bull market became the longest ever on record. 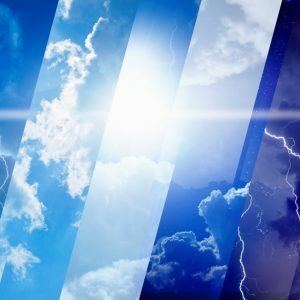 However, the market’s volatility, which only became more pronounced as 2018 came to a close, has little to do with the life of the market cycle. It reflects the recognition of new threats, even if financial experts have not yet grasped the extent to which certain developments will impact the economy or future earnings. Moreover, the markets hitherto have done a remarkable job tuning out much of the noise that would otherwise instill fear in investors. There is, however, a growing case to be made that 2019 could be the year in which markets become less tolerant of geo-economic and geopolitical pressures that wend their way to corporate income statements, such as Brexit, trade wars, and stressed Sino-American relations. In some cases, public posturing among foreign leaders regarding trade has amounted to little more than saber rattling. This seemed to be true in the case of NAFTA, which was rebranded as the U.S.-Mexico-Canada Agreement in October. Through the revised agreement, for instance, U.S. farmers will gain more access to the Canadian dairy market, while certain labor provisions will dictate a minimum wage for a fixed percentage of auto parts produced in Mexico, Canada or the U.S. By and large, however, most observers view the deal as amounting to NAFTA 2.0 rather than representing a significant departure from the previous trade agreement. The negotiations between the U.S. and China, however, appear more consequential, if not interminable. While trade talks did not begin in earnest until July, the Administration’s decision in January to impose tariffs on imports of washing machines and solar cells set a tone that has reverberated throughout much of the year. In March, the U.S. tariffs were extended to steel and aluminum, and from there progressed to levies on more than $250 billion worth of Chinese goods, covering everything from technology and clothing to cosmetics and food. Beijing, to be expected, responded in kind, and the trade spat seemed to hit a climax in December when the U.S. sought to extradite an executive from China’s Huawei Technologies Co. for doing business with Iran. Beyond the soap opera that seems to play out on social media, the trade dispute’s impact has been somewhat mitigated up until now by the strong dollar and, to American officials’ chagrin, a weak Yuan. However, the Fed’s most recent beige book suggests that troubling pressures are starting to affect input costs, which could soon dent corporate profits, and that supply-chain gaps that could stall production are beginning to form. There are also signs that companies accelerated certain purchases to hedge against higher tariffs set to take effect in 2019, which may have pulled forward consumption into 2018 and could negatively affect 2019. The net effect is to fog the business landscape. How the trade dispute will ultimately play out over the next 12 months remains to be seen. Investors have already taken note of the impact on discrete segments of the market (such as soybean farmers or equipment manufacturers). They have also noted the actions taken by select names, including General Motors and Harley Davidson, designed to counter the tariffs’ impact on their businesses. The bottom line is that trade wars are exercises in mutually assured injury. In the short term, no one wins and losers abound. The U.S. economy’s strength in a year in which most other developed markets experienced a pause provided Washington with a modicum of leverage in exerting its will. The current question facing Wall Street and Washington is “what will ultimately be the catalyst that slows domestic growth?” A budget deficit exceeding $1 trillion annually is becoming a target of scrutiny. This came into sharp relief when the Treasury Department released a new third quarter estimate outlining plans for $1.34 trillion in new debt to help pay for the latest budget and the 2017 tax legislation. Economists are now considering the longer-term impact of annual interest payments that could exceed $900 billion annually, or 13% of the total federal budget, in ten years.Putting this into context: total Medicaid spending in 2017 amounted to approximately $577 billion. It remains to be seen how this will play out in the years ahead, but it puts into doubt the potential for material fiscal stimulus, such as an infrastructure plan or additional tax cuts, in the event the economy encounters a rough patch. Given the lack of strategic thinking on what represents a healthy mix between government spending and taxes that support that spending, America’s debt problem will ultimately be resolved through crisis. Historians will see this as a sad and familiar path to resolution. However, this will be a most unpleasant epiphany for a society used to reserve-currency status. While the broader public may be less attuned to the trade war or even the growing national debt burden, a trend that has caught the attention of Main Street is the weakness experienced in certain pockets of the real estate market. While the current slump has not necessarily hit critical mass and has largely been confined to specific markets such as Dallas, Seattle, the broader New York tri-state area, and California, consumers are more sensitive to this area of the economy given the last housing crisis’s cascading impact. To be sure, the real estate landscape today bears little resemblance to the market that a decade ago initiated a large-scale market crash. For instance, household mortgage debt fell below 65% of total household debt in the third quarter, representing a 30-year low, while the number of “underwater” mortgages fell below 5%. Still, the most recent National Association of Realtors data documents that pending home sales have fallen year over year for 10 straight months. Furthermore, commercial real estate asset prices have now eclipsed pre-crisis valuations thanks to the cheap debt and alternative lenders who stepped in to fill the void left by the banks ten years ago. The commercial real estate market was also an area that Janet Yellen had been focused on prior to leaving her Fed post in February. Ms. Yellen never used the word bubble, but she did articulate concerns about how high valuations had climbed. While a real estate downturn is unlikely to cause the same impact experienced in 2008, it would certainly have an indirect effect on the strength of the consumer or, potentially, the lending institutions active in the space and the broader capital markets. Our portfolio positioning has increasingly taken a late-cycle posture. Despite strong earnings growth and the attendant reset of valuations, we did not increase our exposure to domestic equities, especially when the market vaulted higher during the third quarter. We have been equally reticent to run to international equities or the emerging markets as a strong dollar, driven by higher interest rates, makes it harder to realize gains in those markets. Similarly, we have reset exposures that represented style tilts such as value or growth back to a more sustainable core foundation. 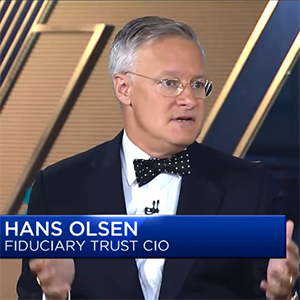 On the fixed income front, we have recommended that investors shorten fixed income duration, which reduces fixed income sensitivity to interest rate increases. We have also recommended eliminating high-yield loan and bond exposures that, until late in 2018, sported very rich valuations. These areas are also exposed to increasingly softer credit protections. On the commodity front, we eliminated our precious metal exposure, which had been principally expressed through gold. As interest rates have risen and a positive inflation-adjusted interest rate emerged, the yellow metal’s allure has dimmed considerably. Gold’s attractiveness, which involves a cost of ownership or “negative cost of carry,” pales in comparison to short-term interest rates on the order of 2%. Finally, we have recommended that clients carry higher levels of cash to act as the ultimate buffer to volatility. 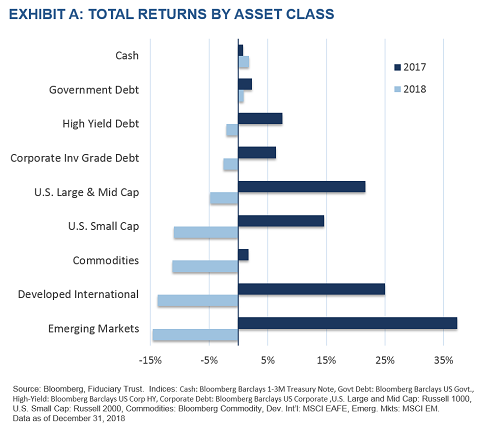 Now that cash has a yield, its attractiveness is hard to overstate as it is completely and perfectly uncorrelated to other asset classes, and clients are no longer forced to own risky assets for a modicum of return on their capital. Two years ago, the catchphrase on Wall Street was that we were in the midst of a TINA market, an acronym that suggested “there is no alternative” to equities for investors seeking a return on their capital. A version of this ethos held that the best strategy to capture a return was to merely identify areas of momentum and then ride the growth until it petered out. Some might say this was how the FANG stocks — Facebook, Amazon, Netflix, and Google (Alphabet) — enjoyed spectacular rises. 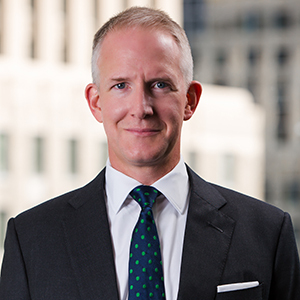 Success in markets in 2019 will be too nuanced to lend itself to a snappy acronym that reduces a successful approach to four letters or fewer. All market pivots present opportunities and the environment ahead favors research and analysis, processes that disqualify behavioral biases, and access to top managers. It rewards a long-term mindset that sees through near-term volatility to identify secular trends offering long-term growth. Therefore, while threats remain and may become more pronounced as economic growth slows, we remain confident that opportunities are available for those who remain attentive to risks and can spot mispricing opportunities as the market finds its bearings.